The Eye of Horus is one of the best-known symbols of ancient Egypt. Known also as the Wadjet, this magical symbol is believed to provide protection, health, and rejuvenation. Due to its powerful protective powers, the Eye of Horus was popularly used by the ancient Egyptians, both the living and the dead, as amulets. Even today, the Eye of Horus continues to be used as a symbol of protection. The origin of the Eye of Horus may be found in the myth of Set and Osiris. The ancient Egyptians believed that Osiris was the king of Egypt and that his brother, Set, desired his throne. Through trickery, Set succeeded in murdering his brother and became the new king. Osiris’ wife Isis, however, managed to bring her husband back to life temporarily through magic and became pregnant with Horus. Osiris went on to become the god of the Underworld and Isis raised Horus on her own. When Horus reached adulthood, he sought to avenge the death of his father. Horus fought Set in a series of battles, and eventually vanquished his uncle. During these struggles, however, he lost one of his eyes. According to one version of the myth, Set had ripped out Horus’ eye, tore it up into six parts and threw it away. In another version, it was Horus himself who gouged his eye out, as a sacrifice to bring his father back from the dead. In any case, Horus’ lost eye was magically restored by either by Hathor (often regarded to be the consort of Horus), or by Thoth, the god of wisdom. As Horus’ eye was magically restored, the ancient Egyptians believed that it possessed healing properties. Amulets of this symbol have been made using a variety of materials, including gold, lapis lazuli, and carnelian, and have been used as jewelry by both the living and the dead. Is the Eye of Horus a Magical Mathematical Symbol? Interestingly, the Eye of Horus is not merely a magical symbol but is also an example of the mathematical knowledge acquired by the ancient Egyptians. In the myth mentioned before, Set tore Horus’ eye into six parts. As a symbol, the Eye of Horus contains six parts. Each of them was given a fraction as a unit of measurement – the right side of the eye is 1/2, the pupil 1/4, the eyebrow 1/8, the left side of the eye 1/16, the curved tail 1/32, and the teardrop 1/64. These fractions add up to 63/64, and the missing part is said to either represent the magical powers of Thoth or to illustrate that nothing is perfect. Each of the six parts of the Eye of Horus correspond to a different sense. The right side of the eye is associated with the sense of smell, as it is closest to the nose and resembles this organ. Needless to say, the pupil represents the sense of sight, while the eyebrow represents thought, as it can be used to express our thoughts. The left side of the eye represents the sense of hearing, as it points towards the ear, and has the shape of a musical instrument. The curved tail resembles a sprout from a planted stalk of wheat or grain. As a representation of food, this part of the Eye of Horus corresponds to the sense of taste. Finally, the teardrop is supposed to represent the sense of touch, as this part of the Eye represents a stalk being planted into the ground, an act that involves physical contact and touching. How is The Eye of Horus Used Today? Although the ancient Egyptian civilization came to an end, the belief in the potency of the Eye of Horus continued and this symbol is still used by many today. As an example, in Mediterranean countries, fishermen would often paint this symbol on their vessels for protection. Additionally, many people still wear the Eye of Horus as jewelery, to protect themselves from the ill-will of others. 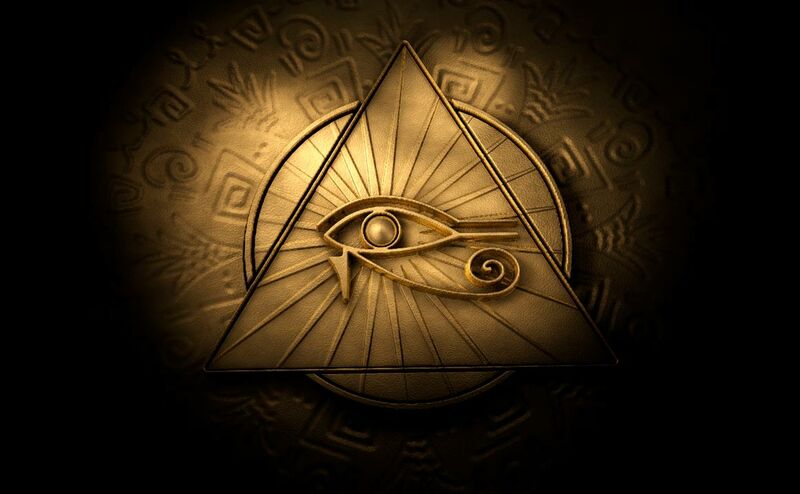 Moreover, the Eye of Horus is popular amongst occultists, as well as conspiracy theorists, who view the Eye not only as a protective symbol, but also as one of power, knowledge, and illusion. Two Eyes of Horus can be seen at the front of this traditional Luzzu boat at Marsaxlokk harbor in Malta ( Anibal Trejo / Adobe Stock ).